Voters said yes to a bond measure for Clackamas Community College. "Estacada turned in a 157 yes to 146 no vote on the bonds," The News reported. "This would appear to indicate that a clear path is now open for the Community College to press ahead with a permanent plant building program, (and) expansion of both vocational and academic facilities to economically provide post high school education for young people and adults of the district." Recent arrivals at the Estacada library included "Dracula," "A City for St. Francis," and "The Shadow Wife." In an advertisement for dental products, Rynning Rexall Drugs warned that, "Teeth don't die a natural death. You kill them." Pro-guard tooth brushes were available for 49 cents, and a container of Colgate toothpaste was 99 cents. "If your dentist suggests you need something we don't have, tell us. We'll order it immediately," the advertisement read. "Have a good week." Events on the community calendar 30 years ago included a Loaves and Fishes Leap Year Party, a sign up event for anyone interested in hosting Japanese exchange students. Several students at Estacada Grade School worked as safety crossing patrollers before and after school. "(They) take their responsibilities seriously. Fortunately, so do motorists who see them with their large flags and big smiles," The News reported. 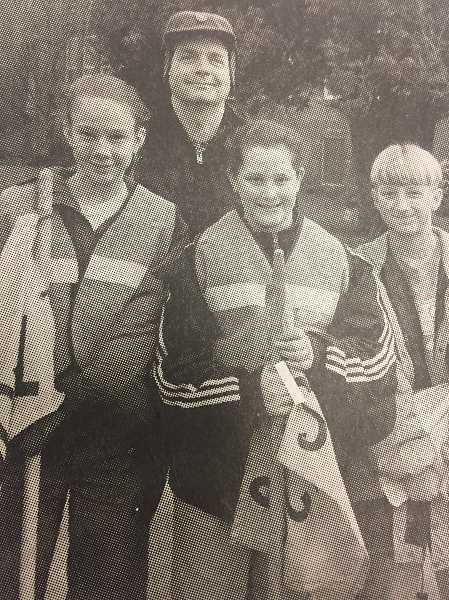 "The Safety Crossing Patrol program has been a part of the EGS for many years. The patrols alternate from week to week and are selected by members of the faculty and administration based on conduct, academic average and a desire to be part of the patrol program." Eagle Creek resident Mike Platz was the lucky winner of a 52-inch HDTV in a raffle organized by the Estacada High School Music Department. Platz had purchased six raffle tickets from Estacada High band member Travis Sandidge. "He didn't believe the message on his voicemail telling him that he'd won until he had his wife listen to it," The News reported. "The music department raised $2,960 after paying for expenses." "The 21 Praises to Tara," Alexa Davis' upcoming show at The Spiral Gallery, took inspiration from the 21 forms of Tibetan Buddhist deity Tara, who represents compassion. Each form of Tara also offers protection from a type of fear or harm. Davis drew further inspiration from a prayer called Praises to the Twenty-One Taras, which is a meditation on 21 forms of compassion. "There are 21 ways to look at compassion, and I made a necklace for each one," Davis said.